When you’re traveling for business, picking, packing and toting your clothes may at times feel like a second job. But a host of apps are trying to make life on the road a bit easier. From online valets to services that essentially offer laundry to-go, corporate trekkers can digitally outsource much of the drudgery around their work attire. 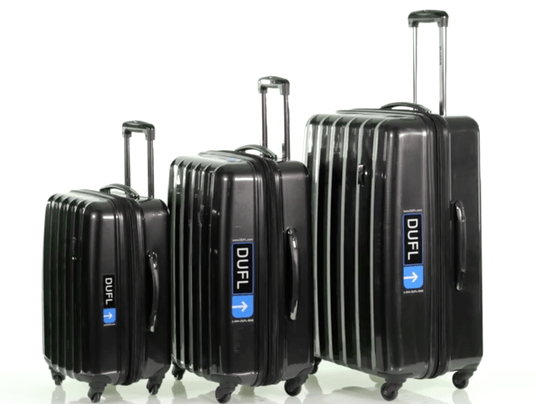 “It’s about the ability to go on a trip … and not worry about anything other than your business,’’ says Bill Rinehart, CEO and founder of DUFL, a “virtual valet’’ that will sort, clean and ship your wardrobe to and from wherever you’re traveling for work. Customers download the DUFL app, then fill a bag the company sends to their home or office with their various business outfits. DUFL will clean, inventory and photograph all the items. Then, “from that day forward, your closet is the app on your phone,’’ Rinehart says. Customers input their business destination, the hotel where they’re staying and the dates, and the suitcase arrives the same day they do. At the end of your stay, you can drop your bag off at the front desk, where FedEx will pick it up and ship it back to the DUFL warehouse where the clothing is cleaned and readied for your next trip. The cost is $9.95 per month plus a $99 fee per trip, which covers shipping and cleaning. Since launching in May 2015, Rinehart says, thousands of customers have registered for the service, with the typical male client storing 50 items in his closet, and the typical woman having 150. “When you think about someone spending the vast majority of time on the road, it’s incredibly time-consuming and stressful,” he says, adding that customers will sometimes order items from Amazon or a department store and have the items shipped right to DUFL. Washio, which started in March 2013, has customers who use its services while traveling for work, as well as when they return home. .
With operations in Los Angeles, San Francisco, Washington, Chicago, Boston and Oakland, business travelers can request a laundry pickup on Washio’s website or mobile app. The clothes are then cleaned and returned to your doorstep. “While traveling for business, most hotel dry-cleaning services are very expensive,’’ says Washio CEO and founder Jordan Metzner in explaining the appeal of his service to business travelers. Meanwhile, those heading out on a corporate trip can get their shirts boxed, for easy packing. And when faced with a suitcase full of dirty clothes upon their return, they can simply send the items off with Washio and they “have clean clothes to take on their next trip,’’ Metzner says. Ben Gillenwater, CEO of his own software company, initially built his PackPoint app for himself. Now PackPoint practically does the packing for him. The app tells users what they need to take depending on their destination and planned activities, right down to reminding them to take an umbrella because it’s likely to rain. And as you pack, you can check off each item within the app. “You can tell it if you will have access to laundry and if you want to repeat basics, like wear a shirt more than once,’’ he says. A paid version of the app, which costs $2.99, can be customized — you can tell it, for instance, to never remind you to pack contact lenses since you don’t wear them. And if you have a TripIt account where you assemble all your travel arrangements, PackPoint will sync with it and automatically create packing lists based on your itineraries. Users input pictures of their clothes and can utilize the app’s calendar to plan their outfits. The app also allows them to create a packing list and even post notes to remind themselves where they wore various ensembles. “With airline baggage fees at an all-time high, suitcase space is precious, and Stylebook can help you bring only items that you need,’’ says Atkins. Apps like these can be real time savers, some users say. Debbe McCall, a business owner and patient advocate and researcher, uses DUFL one to four times a month.